DC, Marvel, Image, BOOM!, Dynamite and more! Discuss everything comics and related to comics. If it's comics and Nightcrawler isn't in it, this is the place! HOLY COW. This is a great read. Anyone else get it? Stars of with a very grizzly outlook and a nice, genuine, refresher to catch up new fans or old ones who may have forgotten. Right off the bat we see April, Krang, Splinter, the 4 Brothers, Doctor Stockman, and even hints of Casey. All in a nice, tightly wound story. Trés awesome, check it out. I highly suggest it. Read my reviews on SuperiorSpiderTalk.com! I'm a real, honest-to-goodness, published comic reviewer! Casey you say? Do tell! For every good Intention is selfish motivation. Casey shows up by the end of the second book. They do a nice job of surprising you with each of the characters. Nice, refreshing, starts for everyone. Good character development instead of just a random guy who shows up with golf clubs and starts hitting thugs on the streets, y'know? that sounds great! I'll have to pick this up... ugh my poor wallet. So...is it a reboot do you thing? I would have to say it seems like a reboot, or at the very least, a re-hashing/updated telling. I think the direction Raph & Casey are going to take are dark avengers, very soon. Did you read the end o issue 2? I haven't got it yet. I only go to the comic shop once a month...the week Previews comes out. But it'll be waiting for me when I get there. I think what Eastman's doing now is picking up the grit from the (his, right?) original series and losing some of what may have dated it, in terms of writing style. In giving the story a breath of fresh air, he is also dusting off the parts of the Turtles that gave them a very "80's" persona. It's possible to keep the grit and loose the camp, and make an entire new balancing-act for the series, and so far -- it appears to be exactly what is going on. Ralph is once again the loner, but in a much more dire fashion. Right off the bat, he's just alone. It's very sad, and I can't wait to see the build up of the (inevitable) reunion. It's obvious that he WAS part of the team at some point, though...the others, especially Splinter, do appear to miss him...but then what father wouldn't miss his son? I wonder what forced the split? Kev and Pete...Eastman and Laird...created the series together...though Kev did do the original sketch that got the ball rolling. For the first several issues they shared everything...writing...pencilling...inking. But when the series started to take off they took to working alone on every second issue, alternating, so they could get them out on a more regular basis, and that's when you could see the differences in their individual styles. Kev's tended to be more realistic with a healthy dose of violence while Pete's were more playful and a little cartoony. You could even see it in their artistic styles...I can scan a few pages for you if you like so you can see it for yourself. Then...when the title got HUGE they bought in more people...some worked for Mirage, some just did guest issues. 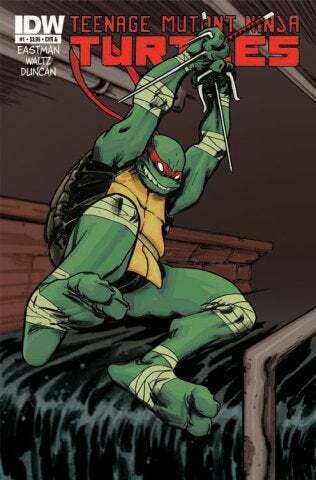 I loved Dan Berger's stuff, though it was a little cartoony, he actually managed to make each turtle individually recognizable...there's this great panel of Raph brandishing his Sai, grinning like a maniac while he says "snikt". I wonder what forced the split? This is explained in Issue 2.
. You could even see it in their artistic styles...I can scan a few pages for you if you like so you can see it for yourself. I feel like they've been able to recapture some of that then in this new series. Remember in the TV show they were different shades of green? Arguably different turtles? I like that in the new series theyr'e not pond-turtles, they're actually SEA TURTLES. Sorta cooler.